KML file for landmark districts in Chicago. To view or use these files, special GIS software such Google Earth is required. Individual landmarks in Chicago. The data can be viewed on the Chicago Data Portal with a web browser. However, to view or use the files outside of a web browser, you will need to use compression software and special GIS software, such as ESRI ArcGIS (shapefile) or Google Earth (KML or KMZ). 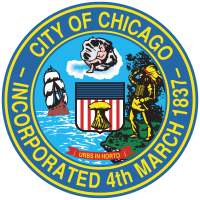 Individual Chicago Landmarks designated by City Council upon recommendation of the Commission on Chicago Landmarks. To view or use these files, special GIS software such as Google Earth is required. To download, right-click the "Download" link above and choose "Save link as." Individual landmarks in Chicago. To view or use these shapefiles, compression software, like WinZip, and special GIS software, such as ESRI ArcGIS, is required. To view or use these shapefiles, compression software and special GIS software, such as ESRI ArcGIS or QGIS, is required. To download this file, right-click the "Download" link above and choose "Save link as." Time Period: Data is current as of June 2012. Update Frequency: Data is updated as needed.